"Jeff Beck meets Ravi Shankar on the set of 'O Brother, Where Art Thou' while dancing in Rio"
A twisted tale of Indian, Blues, Celtic, Swing, Jazz, Bluegrass, and adventure. Fringe Award nominee Josh Bennett (Best Music) joins the genre-hopping antics of Andrew Clermont and the extraordinary vocals and dance of Parvyn (daughter of the renowned singer Dya Singh) to form BluGuru. All bets are off when it comes to what will happen at each show, with the genre and instrumentation changing from one song to the next, but you can expect soaring vocal harmonies, blistering guitar and fiddle, and then 'instrument guest appearances' by such as sitar, tabla, mandolin, banjo, didgeridoo, and of course, Parvyn's shaker. 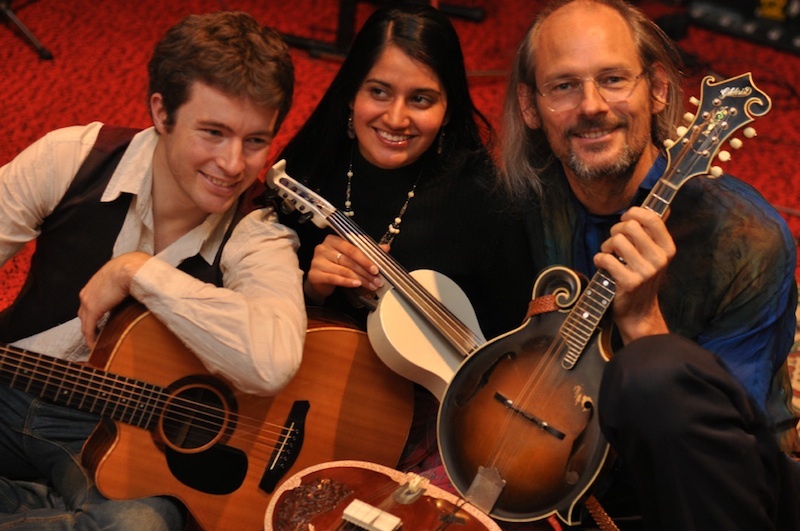 Their debut album, "Ragas 2 Blu Riches" was hailed as a triumph for acoustic music, and covers everything from Jazz and Bluegrass to Brazillian samba and meditative Indian pieces. It includes four live tracks recorded on the road in NSW in 2010. Andrew Clermont is a force of nature in Australian music: 'pumpkin powered' in Totally Gourdgeous (Voted Best Live Folk Band '08); spirited with Australia's multi-awarded/cultural Dya Singh World Music Group; 3-time Bluegrass National Guitar Champ; at the 'cutting hedge of Bluegrass' with The Lawnmowers, and soaring widely with 15 years of Supper Club gatherings. Andrew also initiated the NoHoldsBarred Fiddle Contest and is a Director to the Golden Fiddle Awards. Parvyn combines her rich heritage from ancestral Punjab with elements of jazz, blues, folk and country to perform in her own unique style. On stage since she was five, singing with her father Dya Singh in his World Music Group, Parvyn's stunning, pure and soulful voice has captured the hearts of audiences around the world. She performs traditional, contemporary and original songs sung in Punjabi, Arabic, Hindi, Malay, English and Portuguese, and also performs many styles of Indian dance, including Kathak, Bhangra and Bollywood. She also sings with the Melbourne Bollywood sensation The Bombay Royale as "The Mysterious Lady". Internationally acclaimed as a world-music prodigy, Josh Bennett is as comfortable picking Bluegrass tunes on guitar as exploring Indian raga on sitar. A dedicated student of Smt. Manju Mehta in India, Josh hails from Pt. Ravi Shankar's lineage, and has performed at his house in Delhi to celebrate the birthday of George Harrison. A festival regular and a compulsive jammer, Josh has been known to pop up in all manner of situations, and on all manner of instruments, and is the man behind the mask of "The Jewel Thief" in The Bombay Royale.